A closer look at the target of frozen solution that contains the building blocks for the solar cell material. Materials scientists at Duke University have developed a method to create hybrid thin-film materials that would otherwise be difficult or impossible to make. The technique could be the gateway to new generations of solar cells, light-emitting diodes and photodetectors. The research team described their methods Dec. 22, 2017 in the journal ACS Energy Letters. Perovskites are a class of materials that—with the right combination of elements—have a crystalline structure that makes them particularly well-suited for light-based applications. Their ability to absorb light and transfer its energy efficiently makes them a common target for researchers developing new types of solar cells, for example. The most common perovskite used in solar energy today, methylammonium lead iodide (MAPbI3), can convert light to energy just as well as today’s best commercially available solar panels. And it can do it using a fraction of the material—a sliver 100 times thinner than a typical silicon-based solar cell. Methylammonium lead iodide is one of the few perovskites that can be created using standard industry production techniques, though it still has issues with scalability and durability. 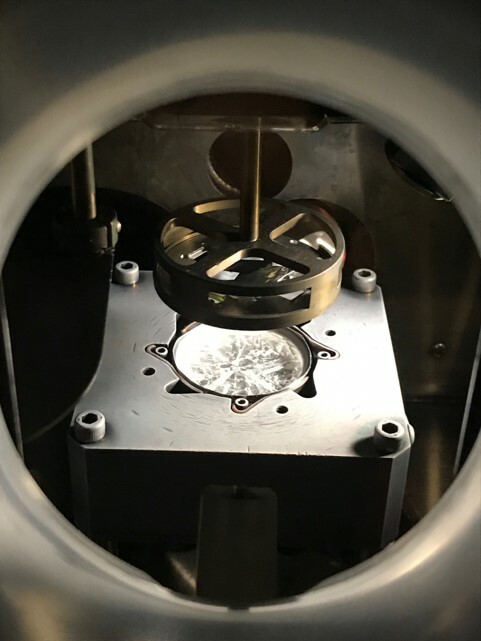 To truly unlock the potential of perovskites, however, new manufacturing methods are needed because the mixture of organic and inorganic molecules in a complex crystalline structure can be difficult to make. Organic elements are particularly delicate, but are critical to the hybrid material’s ability to absorb and emit light effectively. In the new study, Mitzi teams up with colleague Adrienne Stiff-Roberts, associate professor of electrical and computer engineering at Duke, to demonstrate just such a manufacturing approach. The technique is called Resonant Infrared Matrix-Assisted Pulsed Laser Evaporation, or RIR-MAPLE for short, and was developed by Stiff-Roberts at Duke over the past decade. Adapted from a technology invented in 1999 called MAPLE, the technique involves freezing a solution containing the molecular building blocks for the perovskite, and then blasting the frozen block with a laser in a vacuum chamber. When a laser vaporizes a small piece of the frozen target about the size of a dimple on a golf ball, the vapor travels upward in a plume that coats the bottom surface of any object hanging overhead, such as a component in a solar cell. 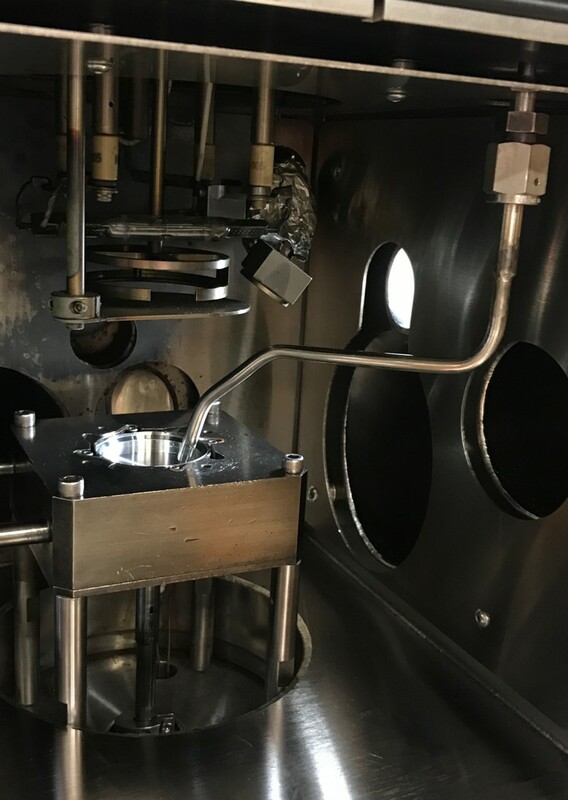 Once enough of the material builds up, the process is stopped and the product is heated to crystallize the molecules and set the thin film in place. In Stiff-Roberts’s version of the technology, the laser’s frequency is specifically tuned to the molecular bonds of the frozen solvent. This causes the solvent to absorb most of the energy, leaving the delicate organics unscathed as they travel to the product surface. Although no perovskite-based solar cells are yet available on the market, there are a few companies working to commercialize methylammonium lead iodide and other closely related materials. And while the materials made in this study have solar cell efficiencies better than those made with other laser-based technologies, they don’t yet reach those made with traditional solution-based processes. But Mitzi and Stiff-Roberts say that’s not their goal. “While solution-based techniques can also be gentle on organics and can make some great hybrid photovoltaic materials, they can’t be used for more complex and poorly soluble organic molecules,” said Stiff-Roberts. This work was supported by the National Science Foundation, Research Triangle MRSEC (DMR-1121107). The research was conducted in instrumentation laboratories that are members of the North Carolina Research Triangle Nanotechnology Network (RTNN), which is supported by the National Science Foundation (ECCS-1542015) as part of the National Nanotechnology Coordinated Infrastructure (NNCI).